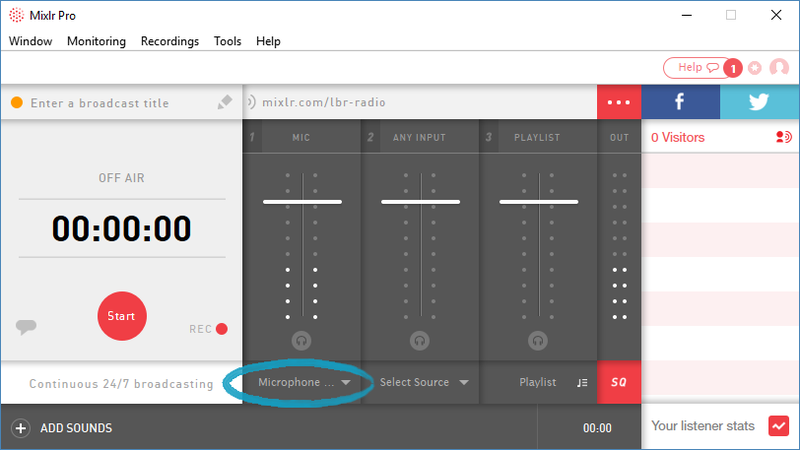 If you want to broadcast your voice live over Mixlr you'll need to use a microphone. With the Mixlr desktop app you have two essential choices: whether you're going to use your laptop's built in microphone, or whether you're going to use an external microphone. The built in microphone is the cheaper option and means you can get broadcasting straightaway. If you are interested in better audio quality you will probably want to invest in an external microphone at some point. This article will show you how you can use both types of microphone to broadcast over Mixlr. If you are using the built in microphone you can skip this step! If you are using an external microphone you will first need to connect it to your computer. It will either have a USB or a phono jack input. We have found that the most reliable microphones to use with Mixlr connect via USB, so we highly recommend using a USB microphone. Connect your microphone to your computer ensuring it is connected securely. You can select your microphone as an input by clicking 'Select Source' for either the MIC or ANY INPUT channel. TIP: you may be able to select your microphone from the Quick start menu. What if I can't see my external microphone? If your external microphone isn't listed here it may be because you connected the device after the Mixlr app was running. If that's the case try clicking 'Reload devices', which appears at the bottom of the list of inputs. Next, click 'Select Source' again - your external microphone should now be available for selection from the input options. If you're still having trouble finding your device contact us here. When the microphone has been selected you will see it listed as the input for this channel, where 'Select Source' was previously displayed. If there is an audio signal being picked up by this input you'll see the visual display indicators for the channel lighting up - these are the white lights showing up in the image above. 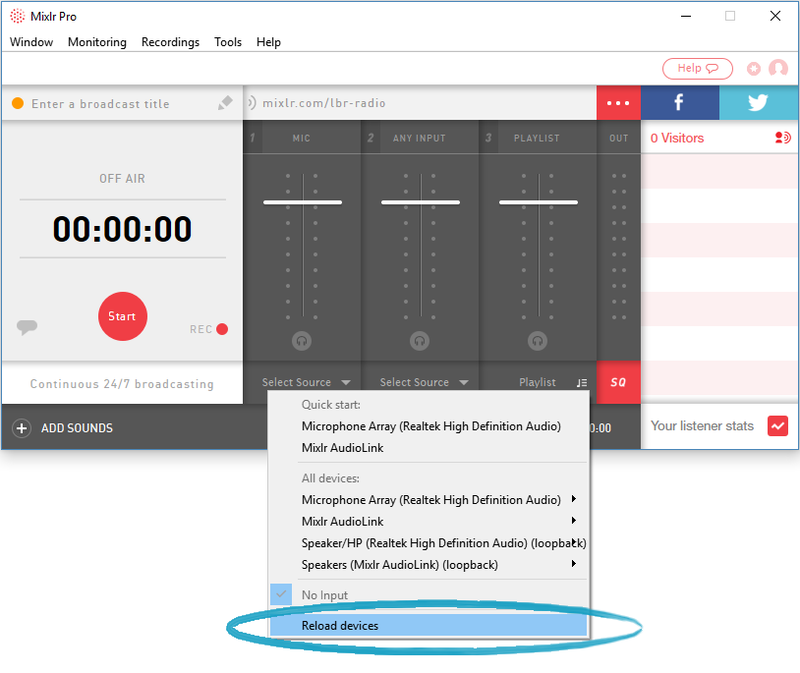 Now that you have set up your microphone, find out how to adjust the volume and activate monitoring.